Dr. R. Hellbach (1869): Der kundige Begleiter in der Hermannshöhle. Some literature about the described cavern. In most cases there is some kind of tourist publication, a booklet or whatever about the cave, which is sold at the cave entrance. They range from elaborated brochures to small books, containing cave description, some background info, and pictures. The good ones even have a cave map and some scientific info. Sometimes, there is good fiction about a cave! Caves are described in novels, legends and fairy tales. In Europe many caves have a legend. Some caves are mentioned in fairy tales. But thats not limited to Europe. 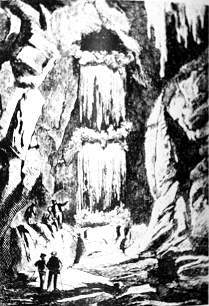 Caves in Asia are often mentioned in religous stories. In the U.S.A. several caves play roles in a book, like Mark Twain Cave, which is described in The Adventures of Tom Sawyer. If the cave was explored by scientists, there are usually several scientific publications. Sometimes there are books, but more often there are papers in scientific magazines. Caves and mines are often mentioned in geological, speleological, archaeological or history books. Author(s) (publishing year): Title, publisher, place of publication, other info. This format of citation is very common in science in Germany, and despite citation in my own profession computer science is rather different, I decided to use this form. It has several advantages, but the most important: everybody will understand the structure, even if one does not read this explanation. And the three most important informations are listed first: author, year and title. Since new browsers allow to use Small Caps all names of persons are written in this style. This applies also to the authors of publications.